In 2008, the Boston University School of Social Work (BUSSW) received a four-year grant from the U.S. Department of Defense to fund a program that would help support the healthy reintegration of soldiers from Operation Enduring Freedom/Operation Iraqi Freedom into their families. As the school wraps up its final year of funding for Strong Families Strong Forces (SFSF), it says the effort has been a tremendous learning experience for everyone involved. With approximately 43% of active duty and select reserve troops being parents, BUSSW researchers were concerned about how very young children of military families handled separation and reintegration. Of the roughly 2 million children who have experienced the deployment of at least one parent, about 42% were younger than 5 years old during the deployment period. But the need for support is critical. 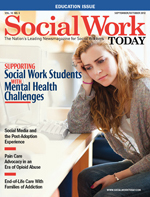 “We know from the literature that prolonged separation from a parent—including deployment-related separation—can constitute a developmental crisis for children in this [under age 5] age range,” adds Abby Ross, MSW, MPH, project director of SFSF and a BUSSW doctoral student. During phase 2, a pilot of SFSF was conducted with nine families. This home-based reintegration work focused on families with young children (birth to 5 years old) and their needs during the deployment cycle. Now in the third and final phase of the work, DeVoe and her fellow investigators have nearly completed the randomized clinical trial and have closed enrollment. Approximately 128 families have participated with only one dropout due to scheduling conflicts. Though the modules are named, DeVoe says they are meant to work only as a guideline and are purposely flexible, as some families may need more guidance in certain areas than others. “Our visits consist of a mix of conversation and activity—some with the whole family, some just the service members and spouse/partner, and some just focused on the kids,” Maynard adds. DeVoe says the program has a wide range of families and about one-half of them are struggling with the service member’s PTSD symptoms. While some have gotten into treatment, others are still trying to figure things out. Either way, DeVoe says these families need a lot of attention, as family life and parenting can lead to triggers for PTSD symptoms. Many families also are typically dealing with a “restructuring” of the family structure once the military member returns home. The roles of “who does what” need to be figured out all over again, as a spouse may have gotten used to handling certain roles while the military member was away. “It can be a serious renegotiation from a systems perspective,” DeVoe says. Ross also says she’s learned how resilient these families are, and she’s realized that military-civilian partnerships are critical to a successful program. “Our partnership with the military community maximizes the relevance, feasibility, and long-term sustainability of the SFSF program,” she says. It’s also become obvious that a universal phenomenon following deployment is change. Deployment changes everyone in the family in some way, and families must learn to live with these changes. DeVoe says even in a relatively peaceful deployment, the experience still changes everyone.